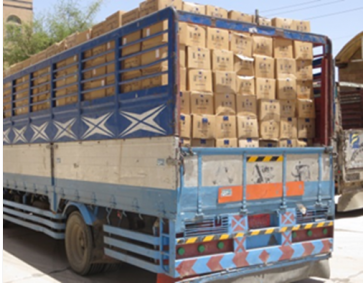 In response to an urgent request from the Yemen Ministry of Public Health and Population (MoPHP), procurement of EUR 200,000 worth of medicine and consumables was recently organized and carried out by the project team of the European Union (EU) funded ‘Support for Effective Stewardship in the Yemeni Health Sector’ Project and Reproductive Health and Population Programme. The ongoing conflict and airstrikes in Yemen have resulted in severe healthcare supply shortcomings throughout the country, making this recent distribution both exceptional in organization and much needed by medical professionals. By building on trusted relationships established through ongoing technical assistance support in Yemen since 2006, the procurement, delivery and distribution of the medical supplies was made possible due to extremely dedicated teamwork and collaboration among EU project team members, MoPHP counterparts and medical professionals in the participating Governorates. The procurement initiative was organized entirely through local channels, utilizing an established importer of medical equipment and supplies licensed by the MoPHP. This enabled the purchasing and distribution of medical supplies to be quick, cost effective, while also importantly providing funds to the local economy at a time when livelihoods are being greatly disrupted due to fighting. The medical supplies have the capacity to treat about 3,000 patients in need of surgery and intensive care and more than 3,000 patients with minor injuries in hospitals located in Sana’a, Sa'ada, Dhamar and Al Bayda, Hajjah, Al Hudayda, Taiz, and Lahj. A buffer stock will also remain in the MoPHP warehouse. The supplies were carefully selected and controlled, ensuring their ability to respond to present needs while maintaining a long shelf life in order to maximise utility beyond the current emergency. Concentrated co-ordination for the procurement of medical supplies took place over the last half of April, with communications among EU delegation officials in Brussels, Belgium; EPOS headquarter staff in Bad Homburg, Germany; and project technical assistance team members on the ground in Yemen taking place almost hour-by-hour due to the deteriorating working conditions brought about by the airstrikes. Success was achieved through unwavering research work and assurance of the quality of the items to be purchased. Constant logistical challenges, arising from the evolving conflict situation, were overcome by incredible dedication, patience and co-operation put forth by the technical assistance team and MoPHP counterparts. The delivery of the supply is coupled with refresher trainings on mass casualty management and triage targeting health professionals already working in emergency departments. To date, 92 health professionals have been trained. The European Union (EU), made up of 28 Member States who have decided to gradually link together their know-how, resources and destinies, has built a zone of stability, democracy and sustainable development whilst maintaining cultural diversity, tolerance and individual freedoms. The EU is committed to sharing its achievements and its values with countries and peoples beyond its borders. To this end, the EU has been active in Yemen since 1998 and provides funding for both humanitarian and development assistance. So far, the EU has committed more than EUR 60 million in support of the Yemeni health sector. In this frame, the cooperation with EPOS Health Management aims to strengthen local and national structures. The ongoing projects (‘Support for Effective Stewardship in the Yemeni Health Sector’ and 'Governance in Health: Technical Assistance for Local Health Systems Strengthening') aim to create a coordination mechanism that enables the MoPHP to effectively steer its sectors and departments internally as well as lead the subnational governance levels and development partners. EPOS is supporting technical assistance implementation through a team of experts who are posted at key functional units of the Ministry to support its stewardship role. Additionally, the technical assistance aims at directly in increasing the availability of information for decision making through an improved health management information system (HMIS) and the conduct of public expenditure tracking surveys (PETS).